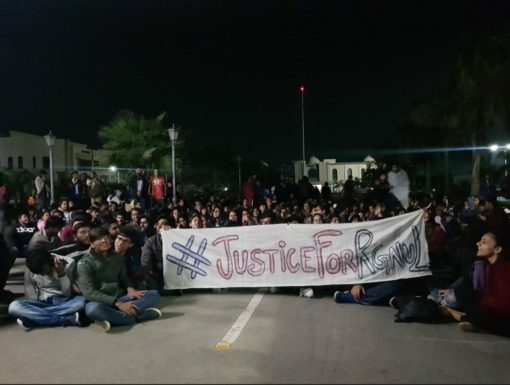 The students of Rajiv Gandhi National Law University (RGNUL), Patiala, have been protesting since March 15 in the university premises against the suspension of six second year students. The students were suspended indefinitely for raising their voice against the unhygienic food served in the hostels. The students have called this suspension “arbitrary and wrongful”. Talking to Newsclick, a fourth-year student of RGNUL said, “The students did not damage any property or indulge in any violence. They banged their plates against the tables to protest against the unhygienic food that is served in hostels, for which they pay a huge amount of money. We have been complaining about the quality of the food for very long, but the hostel administration did not pay any attention to our complaints. So, on March 13, when the students from second-year started protesting, other students in the mess also joined them. The six students who were suspended did not instigate anything.” The student chose to remain anonymous, fearing that he might be targeted by the administration if his name was revealed. Students have claimed that the order for suspension is invalid, as it was issued without a proper hearing, and in the absence of Vice-Chancellor Dr Paramjit Jaswal. The protesting students claimed in a statement that the suspended students "were subject to degrading treatment constituting a deprivation of their Right to Privacy" as their mobile phones were forcibly confiscated and their private conversations read. The fourth-year student also said that the e-mails which the students send from their official e-mail IDs issued by the university administration were also monitored. The students of RGNUL, on March 16, sent a representation to the Chancellor of the university, demanding immediate revocation of the suspension order. Apart from that, it also highlighted several other demands, like a formal inquiry into the conduct of the A.O. of the university, formalisation of the student body, and thorough review/repeal of discriminatory practices enfranchised by the university apparatus. The students have accused the A.O. of repeatedly offending the value system that the university subscribes to. They have said that there are multiple instances of him making sexually coloured remarks that violate the dignity of women in the institution, both orally and through electronic media. The students have demanded the removal of the A.O. after a formal enquiry investigating his behaviour. Riot Control vehicles have been deployed in the university premises to scare the protesting students. Student bodies from various universities, including National Law University and Delhi University have extended solidarity to the protesting students of RGNUL.